Bring organizer standing flower display rack to your patio, living room, or garden. Made of sturdy and durable metal with a matte black powder coated surface, this multi-level planter stand is suitable for different location. 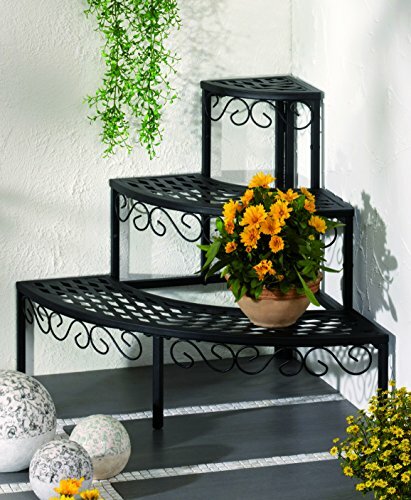 Perfect decorative accent to indoor or outdoor space with this 3 tier plant stand metal. If you're ready to bring organization and style to home, this 3 tier stair step will be big help for you. The plant holder stand provides plenty of space for showing off your favorite plants and decorations. Place this metal plant stand on your patio, balcony or living room to add a touch of charm to your daily routine. If you have any questions about this product by FRESH AIR FOREVER, contact us by completing and submitting the form below. If you are looking for a specif part number, please include it with your message.